We get asked a ton of questions about GWO safety training so we thought we’d pull them all together into this handy Q&A. We regularly get asked about GWO safety training, why you need it and what are the benefits so here’s the lowdown. GWO training has been around since 2012 when it first published it’s Basic Safety Training Standard (BST) in response to demand for a recognisable standard in the wind turbine industry. This was follow up with the Basic Training Technical Standard in 2017. GWO members, which includes anyone who’s anyone in the industry, accept a BST certificate as confirmation a technician or other wind turbine professional possesses the required knowledge to stop an unsafe work situation. In plain english it means that you need the certificates if you want to work on a GWO members turbines. GWO stands for Global Wind Organisation. A non-profit body GWO was founded by wind turbine manufacturers and owners. 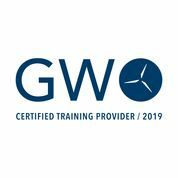 GWO was created by it’s members to strive for an injury free work environment in the wind turbine industry, setting common international standards for safety training and emergency procedures. What are GWO training standards? GWO training standards describe the requirements for training courses that are recommended by members of GWO. By complying with GWO standards and criteria, certified training providers are considered competent and proficient. How do I know a training provider is certified? Only certified training establishments can display this logo. You can also ask to see a certificate issued directly by the GWO. What are the individual GWO safety training standards? Do they make the work environment safer? Absolutely. A survey of members shows 62% strongly agree that GWO standards have improved alignment and quality of basic safety standards across the industry. I have training how does this measure up? GWO provide a merit system for organisations with training systems in place. This assesses the training you have, identifying any gaps and subject to receiving training on those gaps you or and your employees can become accredited. Most courses are run over one or two days with practical training and assessment. Refreshers usual take a day and should be taken annually. STL operate GWO safety training courses at state of the art facilities in Huntstville, Texas and Estherville, Iowa. That’s the easy bit. Fill in our form a tell us what you need, don’t worry if you’re not 100% sure one of our team will be able to advise you on the most suitable course for your situation.